For decades, the mutants of the Marvel Universe have been hunted by the Sentinels, enormous robots that fly through the air, detecting the mutant gene as they pass over an area. 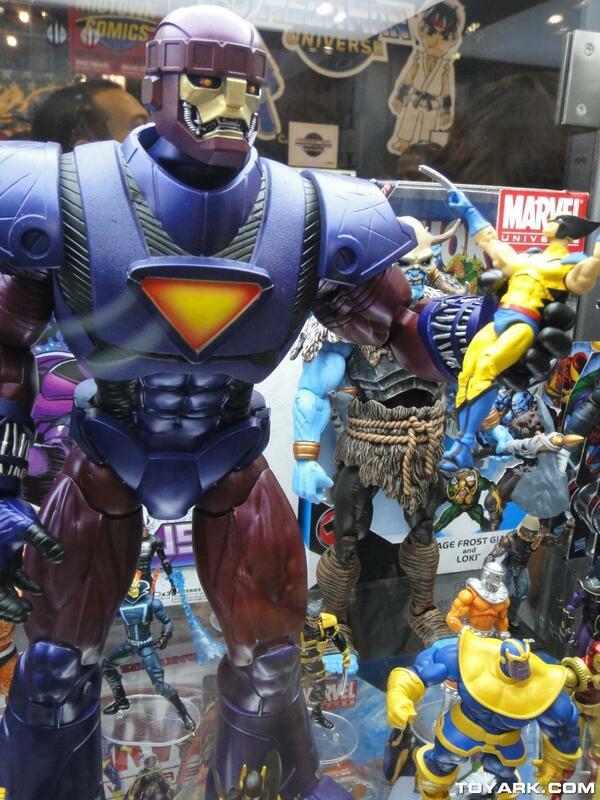 This dangerous cybernetic creation of Bolivar Trask becomes the latest in Hasbro's Marvel Masterworks figure line as the Marvel Masterworks Sentinel Figure. Standing 16" tall, the robot comes with a matching 3 3/4' Wolverine™ action figure.Includes 3x "AAA" batteries. It was fear that drove Bolivar Trask to create the Sentinel Program. He had studied the history of human development, and hypothesized that the rise of mutants meant the end of humanity as he knew it. The trajectory of the future awoke in a gut-wrenching terror - one that guided every decision he made for years. THe discovery that his own son was a mutant only confirmed his fear. The solution Trask created was an enormous machine - a multistory engine of destruction. Thirty feet tall, Trask's SENTINEL™ robots were capable of high-speed flight, and wielded powerful concussive energy blasts with deadly precision. Though Trask quickly came to realize his mistake, the legacy of his fear lives on in the software that allows these robot hunters to detect and disable mutant powers, and the mighty weapons they carry. The X-MEN™ have faced these destructive machines countless times, and each encounter has been more dangerous than the last. As technology has improved, each generation of SENTINEL™ has become more effective at its primary task - the destruction of all mutants. The margin of victory for the X-MEN™ has become more and more narrow in every battle until every mutant has come to believe that its only a matter of time before even the X-MEN™ are overcome, and Trask's terrible dream, becomes a reality!